The Undergrad Writer: Oh, So You Want to be a Teacher? Being an English major combines many of the things in life that I enjoy deep down to my core: I love reading, which is nice because most of my assignments are lengthy portions of text. I love writing, both creatively and academically, so hunkering down to bang out an eight-page paper, if I have enough time, is not a burden, but an adventure. I love learning, so researching for papers and assignments is my favorite part. And because I love learning, I love workshops. Well, I’ve grown to love them, as mentioned in my previous blog post. I realize constructive criticism will only improve my writing, and therefore I welcome it with ready ears. There are a few aspects of working towards an English degree that aren’t as wonderful (how heavy my backpack can be on any given day is one of them), but there is a single factor that stands out as the worst part. Oh, so you want to be a teacher? 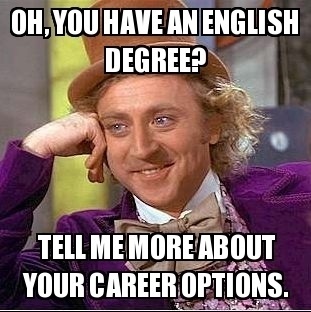 Nine times out of ten, this is the response I receive when I mention I’m an English major. I want to emphasize that being a teacher isn’t a profession I devalue. I love and admire the work of teachers. The absurdity comes with thinking of me as a teacher. Patience is a trait I admit I need more of, and therefore, managing classrooms full of young children is not an environment where I see myself thriving. When I am approached with the teacher assumption, I deny the temptation to roll my eyes as if to say, “Don’t you know whom you are talking to?” and then the desire to defend myself kicks in. This usually elicits an, “Oh! Cool!” and it’s over. I could never be a teacher, as mentioned previously. I see and hear about what she does everyday, and although I admire her, I cringe. But when I come back down from my daydream, I’m back to being an unapologetic realist who knows her limits. I used to be a caretaker of three elementary-age children, and while I really enjoyed it, I traded that in for a work-study job at my college within the year. Basically when we get down to the details, I can’t deny my life-long dream of a desk-job. I’m a career woman. Or at least I want to be. Who knows where I’ll be five years from now, ten years, or even fifty. I only discovered my desire to work in book publishing within the past two years, and I’m well-aware of the statistic about the average American changing their career multiple times throughout their lifetime. But this is my starting point, and I’m excited about it. I want to end giving a virtual round of applause to teachers everywhere. And when that’s over, I will go back to fantasizing about how I will decorate my future office.